A big day out on the east side of Ruapehu, with plenty of moments of ‘will it go?’ and ‘holy smokes, it does’. Have you heard of the pastime ‘finger tramping’? It’s what actual trampers do in between tramps to satisfy their wilderness addiction – all you need is a topo map and something to point at it with (a finger will do; two if you’re enthusiastic; a pencil if you’re polite). Ski tourers go finger tramping too, of course, only the distance covered (and hence finger tramping potential) tends to be slightly less than when striding out walking, due to all that uphill/downhill business. I’d been finger tramping on Ringatoto (2591m), one of Ruapehu’s summit peaks, for years before I actually went. A friend attempted an axe and crampons climb, approaching from Rangipo Hut on the mountain’s eastern side, but turned back after getting the willies due to exposure, and before putting the rope on. I couldn’t find out much about it online aside from the generic climbing advice that it was ‘big, steepish and loose’, but was mollified by climber Sam McEwan’s astounding photos (click here for his eastern ridge approach, and here for a taster as part of the 12 peaks mission). I had an objective to bag all of Ruapehu’s summit peaks as alpine missions (either climbing or ski touring, or better still, ski mountaineering) within one winter. Ringatoto seemed like an unattainable challenge, located in a part of the mountain I didn’t frequent, and with little beta to go on. And when the 2018 NZAC North Island ski touring meet came up in October, I still hadn’t bagged it, and with a clear, hot and still forecast for the Saturday of the meet, a Ringatoto mission seemed like just the ticket to fill in the day. Big, steepish, loose, difficult, dangerously unstable. Sounds like all the necessary ingredients for a fun day out. We left early on the Saturday from the Tukino Alpine Sports Club lodge, downing breakfast at 6am, and had skins on our skis and on the snow by 7am. I’m fairly sure I saw more than one of the ski touring meet attendees shake their head at our dawn enthusiasm. Still, I’m not the fastest on the uphill, and we wanted to give ourselves as much time as possible to complete the mission (or fail at it…). Getting up to Whangaehu Hut is a piece of cake, at least in good weather – and we had plenty of that. By the time we reached the hut we were peeling layers off, with the sun hitting our faces and no wind to speak of. If only we’d bought shares in a sunscreen company. From Whangaehu Hut you need to get down a couple of contour lines into the Whangaehu itself before you start climbing. We could’ve removed skins and traversed in, but that part of the snowpack sits in the shade for much of the day and was hard as nails. 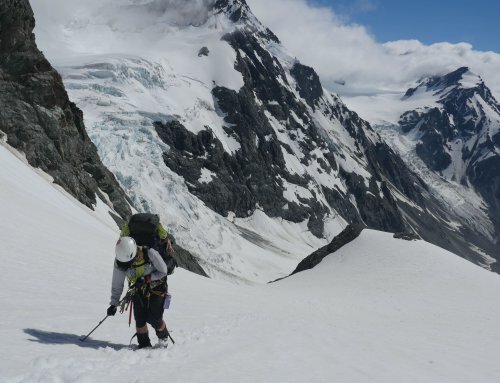 It would take longer, but to be on the safe side, we racked our skis on our packs, donned crampons, and used an axe each to bite onto the snow as we descended. I felt silly about an hour later when, from a distance, I saw another party traverse in without incident, but you make the decisions you think are right at the time. So be it. From there we transitioned back to skis and skins, and made our way up the Whangaehu catchment. There was plenty of ‘will it go?’ moments, followed by ‘holy smokes, it does’. The snowbridge was indeed in place – in fact, the whole river was basically still a snowfield – and after a fashion we came to a spot near the bluffy head of the Whangaehu, around the 2340m mark, where plenty of rocks and ice were falling off the nearby cliffs. We were in the box seat for the big show. Transitioning back to crampons and axes, we climbed steadily, zig-zagging up the slope to the saddle leading to the Wahianoa Glacier. Ringatoto affords excellent views into the Wahianoa, an area I’ve passed across before while tramping the Ruapehu Round the Mountain track. The Wahianoa gorge looks small on the topo if you’re finger tramping it, but is somehow much more colossal and imposing in the flesh. We discussed possible routes down the Wahianoa Glacier, avoiding the bluffs (of which there are many) and exiting via the track. But that was a mission for another day. After summit selfies, we rearranged our gear and prepared for the ski down, which took around 20-25 minutes in total. We got to ski off the summit proper (always a buzz!) and more or less followed our route back down. The prospect of skiing back into the Whangaehu from the saddle gave me the willies a bit, so I let my ski touring buddy go first as the guinea pig. It looked soft enough and well doable as he dropped in – lots of hold on the traverse in – so I gave it heaps with confidence. The 200m ski back down had its moments, however – mostly because you constantly ski over small rocks, embedded in the snow so they never touch your skis, but which you can’t see until you’re right on top of them. Never mind, I thought; that’s what backcountry skis are for. From Whangaehu Hut we did a short bootpack to regain the ridge and avoid bluffing ourselves in steep terrain, and enjoyed a cruisy, wide open hoodle back to our Tukino base. And if I said I was tired after all that action, it was an understatement.